CLASS OF 1984: The Blackboard Jungle Goes New Wave – Schlockmania! The early ’80s were the last great era of exploitation filmmaking, marking the last time that independent filmmakers could still get into theaters with a film about a timely topic and compete with the major studios. One of the best, most iconic b-movies to emerge from this era was Class Of 1984, a tough, compelling picture that remade the juvenile deliquent genre for the post-punk 1980’s. It maintains a healthy cult following thanks to its combination of savvy filmmaking and a theme of rising school violence that remains all-too-current. The plot of Class Of 1984 suggests a new wave remake of The Blackboard Jungle with the stakes updated to R-rated levels. The hero is new schoolteacher Andy Norris (Perry King), who discovers the high school he’s working at is overrun with crime and drug use. This vice is orchestrated by Stegman (Vincent Van Patten), a smart but psychotic teen who leads the school’s dominant gang. Norris does his best to protect the other students from Stegman but his resourceful foe keeps the upping the ante and claiming casualties. When things get too personal, Norris has to have a showdown with the gang on Stegman’s vicious terms. The best exploitation movies allow the viewer to have their cake and eat it too by offering plenty of sleaze and excitement while also giving the viewer a compelling story and sometimes a little food for thought. Class Of 1984 pulls off this balancing act with confidence, exhibiting smarts on multiple level s as it delivers the goods. The clever script gives us likeable heroes, a villain who has a few complex character shadings to give his evil deeds some dimension and – best of all – is laced with quotable, often darkly humorous dialogue that makes the verbal confrontations as entertaining as the physical ones (Schlockmania’s favorite quote: “Life is pain. Pain is everything.”). 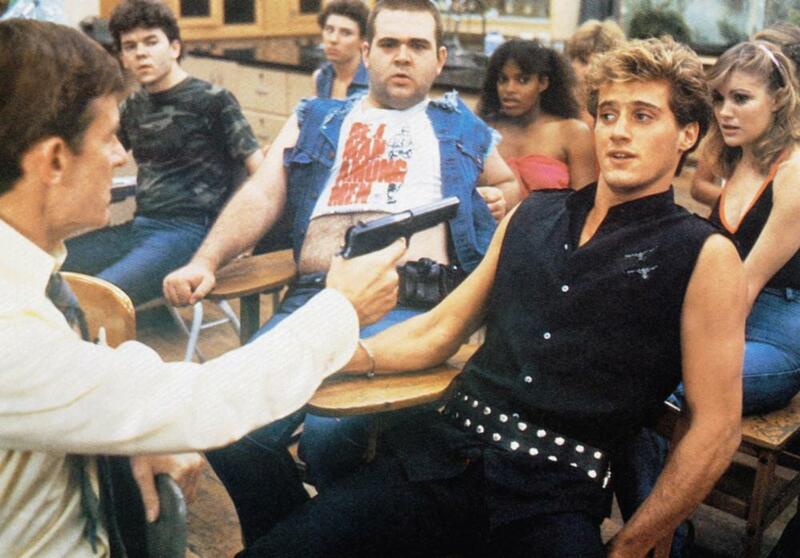 The expected fights and violent revenge finale are all set up with manipulative skill but the screenwriters, including a young Tom Holland, add some unexpectedly inspired touches: the best might be a moment where teacher Terr y Corrigan (the great Roddy McDowell) holds Stegman and his gang hostage during class, forcing them to answer science questions at gunpoint. Beneath it all, the film makes some salient points about the inability of schools and inattentive parents to deal with violence-inclined problem children: sadly, this theme has not aged a day since the film’s original release. Class Of 1984 is also blessed with A-level performances from a cast who plays the material straight. King brings both charm and dramatic chops to his role, selling the audience on the sincerity of his characterization nicely. Van Patten is deliciously evil, creating a portrait of extremely resourceful psychopath who can do anything from childish pleading to violent threats to get his way. McDowell offers ace support as Norris’ tragic/sarcastic teacher p al and the gang members are all vivid, particularly Lisa Langlois as the gleefully nasty female of the group and Stefan Arngrim as the resident drug expert with a dry wit. Children of the ’80s will also be amused to see a young Michael J. Fox as a student trying to dodge Stegman’s wrath. That said, the key to the success of Class Of 1984 is the slick yet hard-hitting direction from b-movie vet Mark L. Lester. He gives the larger-than-life storyline a punkish, comic-book look full of vivid colors and effective use of trashy surroundings, with cinematographer Albert J. Dunk’s lensing making it look like The Warriors. Lester also adds dramatic tension with a great Lalo Schifrin score that mixes percussive orchestrations with new-wave synth drones (not to mention the memorable Alice Cooper theme song). Most importantly, Lester balances the film’s well-crafted dramatic content with an array of exciting setpieces that keep the film’s pace energized, like the aforementioned teaching-with-a-gun sequence, a gang rumble and a fiery car stunt. However, his finest achievement in this regard is the school-set showdown finale: critic Roger Ebert once described the finale as a cross between The Hunchback Of Notre Dame and Beyond The Valley Of The Dolls. It lives up to this wild description, offering a mixture of effectively choreographed fights and creative deaths that use the school setting to malevolent effect. In short, Class Of 1984 is required viewing for any cult movie buff into classic exploitation cinema. Like it’s villain, it is as smart as it is brutal – and that’s what makes it an alluringly dangerous piece of cinema.